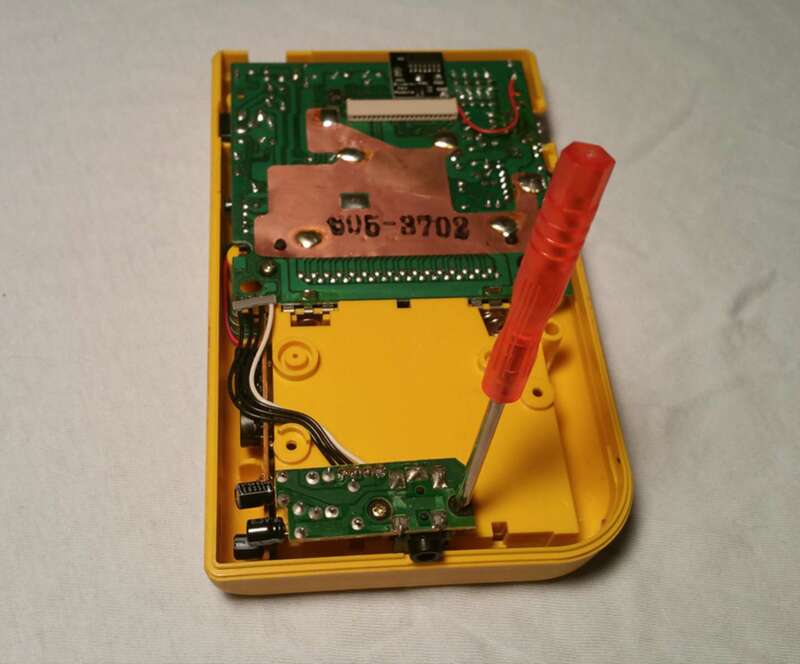 In this guide, I’ll be updating a back-lit Game Boy with a yellow Play It Loud shell. 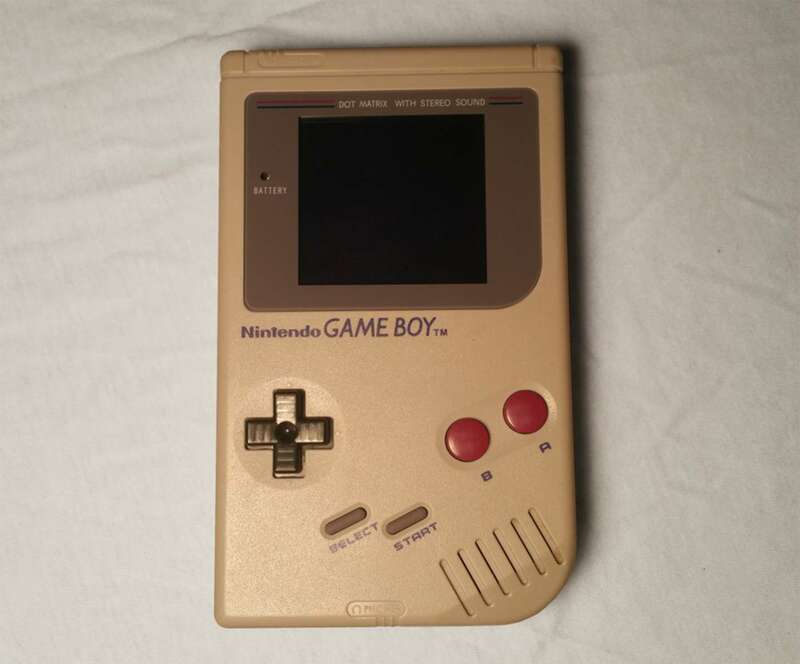 The Nintendo Game Boy was released in 1989. Millions of units sold to people worldwide before discontinuing in 2003. 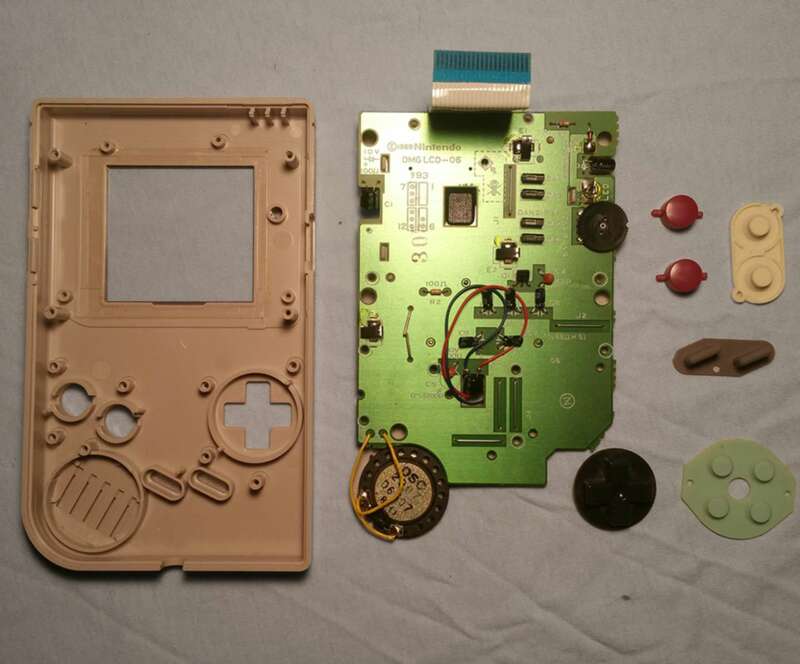 After almost 30 years, many Game Boys show signs of deterioration. Improper storage can lead to sun damage, water damage, and even battery acid damage. 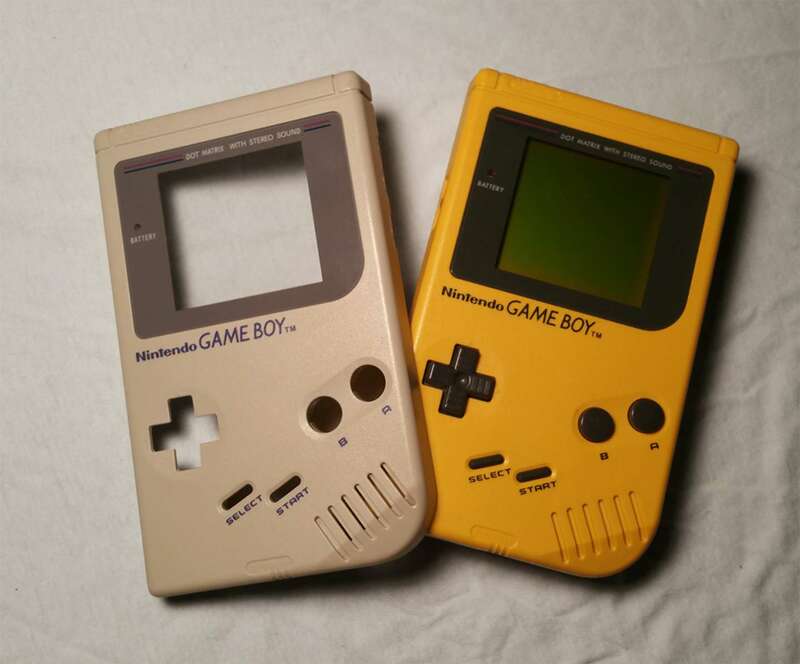 Nintendo no longer offers official support or replacement parts for the original Gameboy. You can find used and aftermarket replacement parts online. Start off with a thorough examination of the Game Boy. Take note of the screw types used in the Game Boy shell (phillips vs. tri-wing*). Some screws may be missing, aftermarket shells often come with replacement screws. Look for signs of serious damage that may impact the hardware inside. 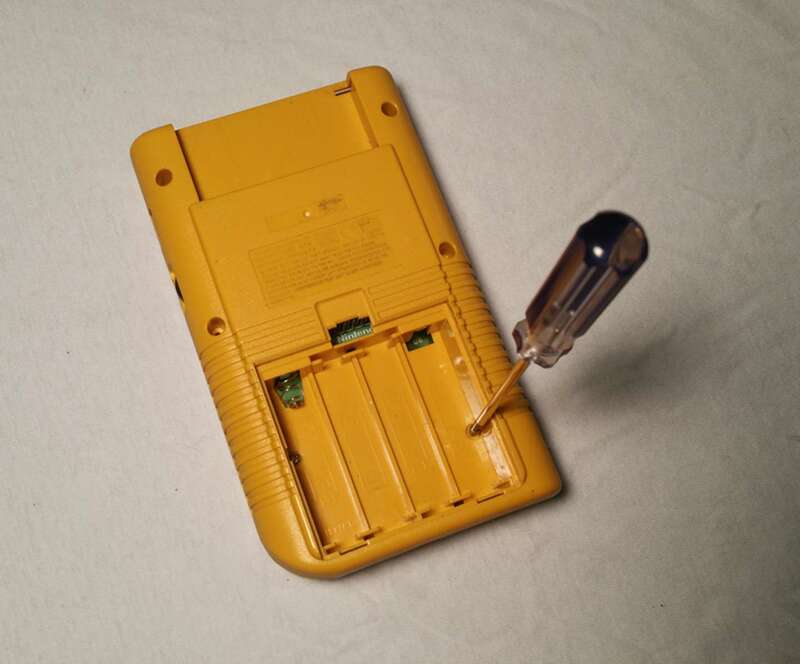 *Most Game Boy models use tri-wing screws and require a proprietary tri-wing screwdriver. Some of the earliest models only use phillips screws and will not require a tri-wing screwdriver. The easiest way to know is to examine your Game Boy. 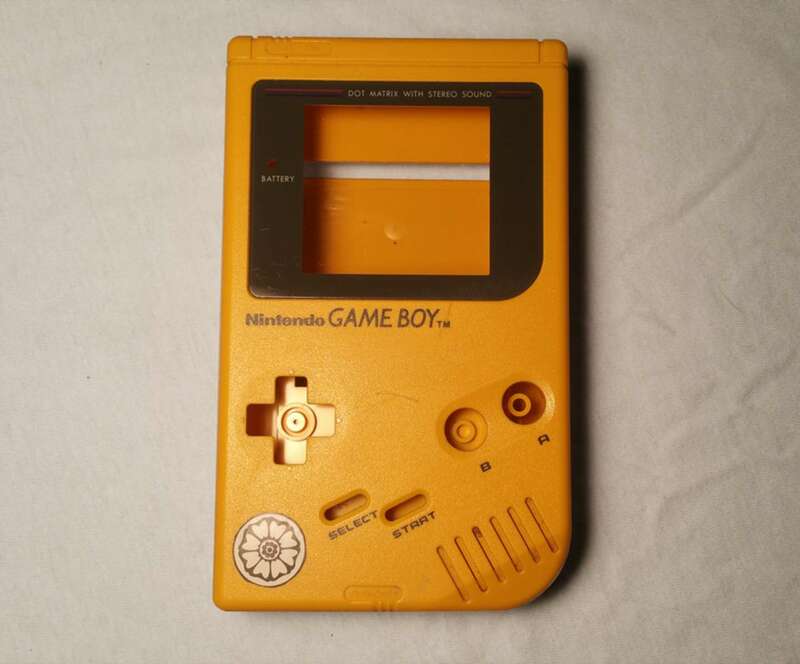 If the damage is too severe or your Game Boy is sentimental, it may be in your best interest to find a new one. 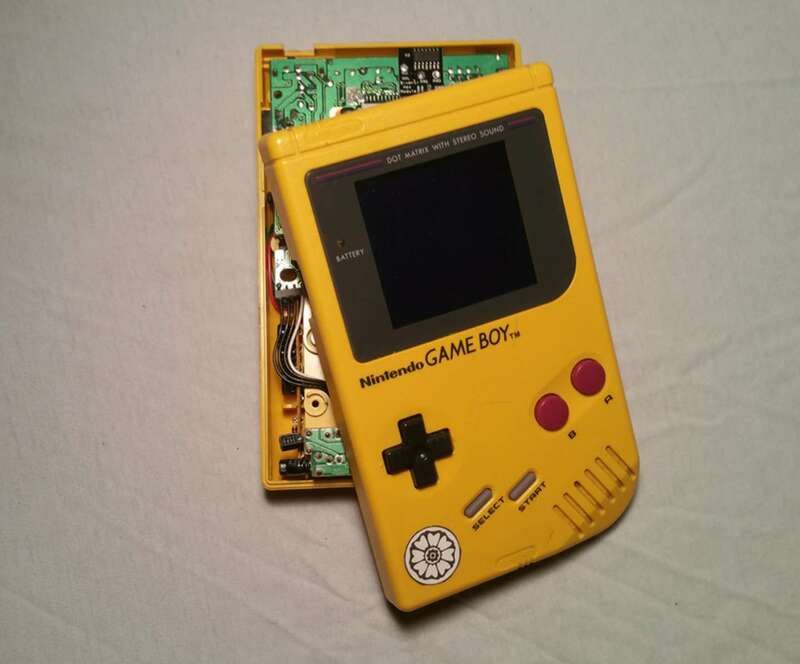 Modding a Game Boy can have irreversible impact on the device. Make certain you’re ready to proceed. There’s no need to rush this step, it’s absolutely okay to finish that level first. But when you’re done, be sure to flip that power switch to “off” in the top left corner! 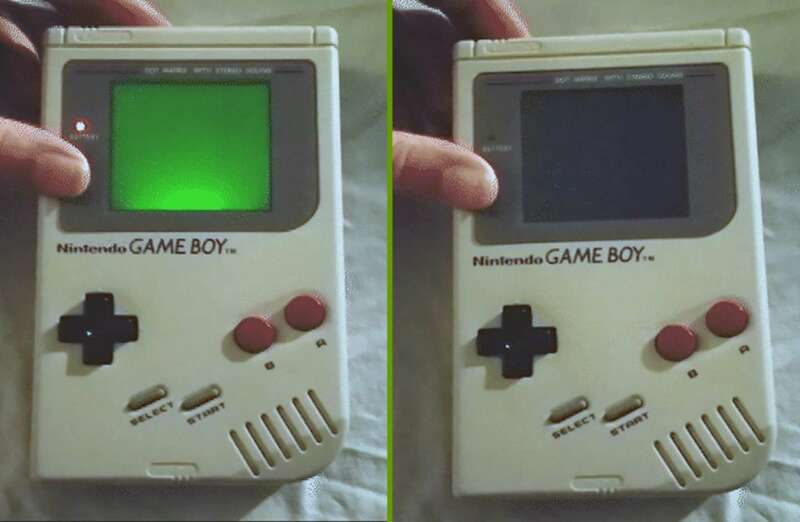 If you’re uncertain when the Game Boy last received fresh batteries, wear gloves and be cautious throughout this step. Remove the battery cover and set it aside. Carefully pry each battery from the slot. 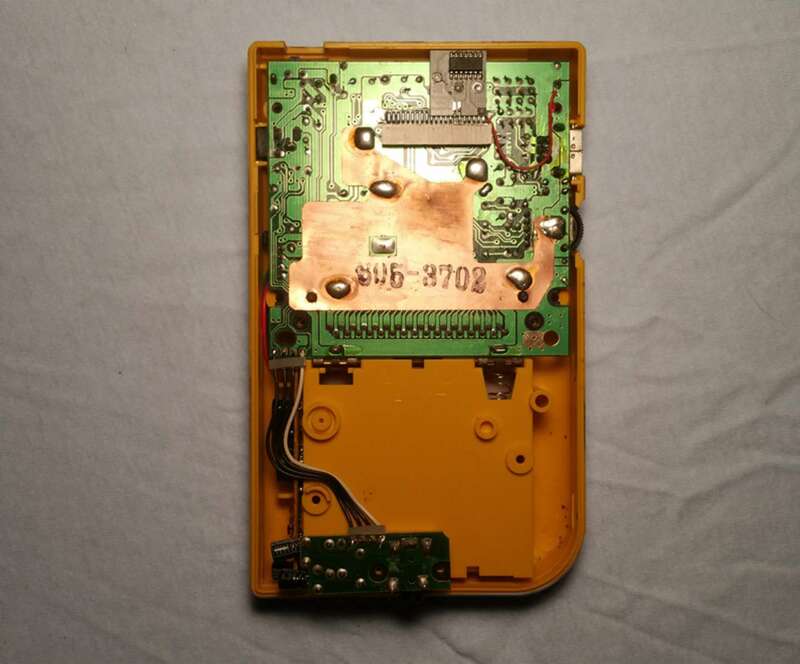 If you find battery acid has leaked into the Game Boy, it may be time to seek a replacement. If everything looks good—or the damage is repairable—it's time to take it apart. Place the Game Boy face down on a gentle surface. 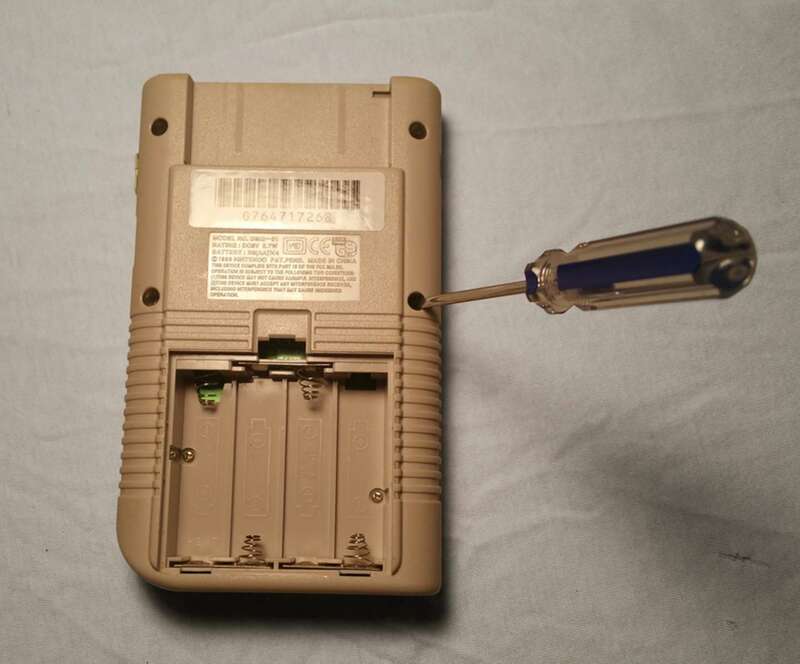 Using an appropriate screwdriver, remove and store each screw from the Game Boy shell. There will be 6 screws to remove from the outer shell. There are two motherboards mounted to the Game Boy shell—one to the front half and one to the back. The two boards are connected by a delicate ribbon cable. This cable connects the front screen to the back motherboard. This cable is very sensitive and extremely vital to the functionality of the screen. Unplugging and reconnecting this cable can be a risky maneuver to pull off. The wires are easily bent which can cause irreparable damage to the display. 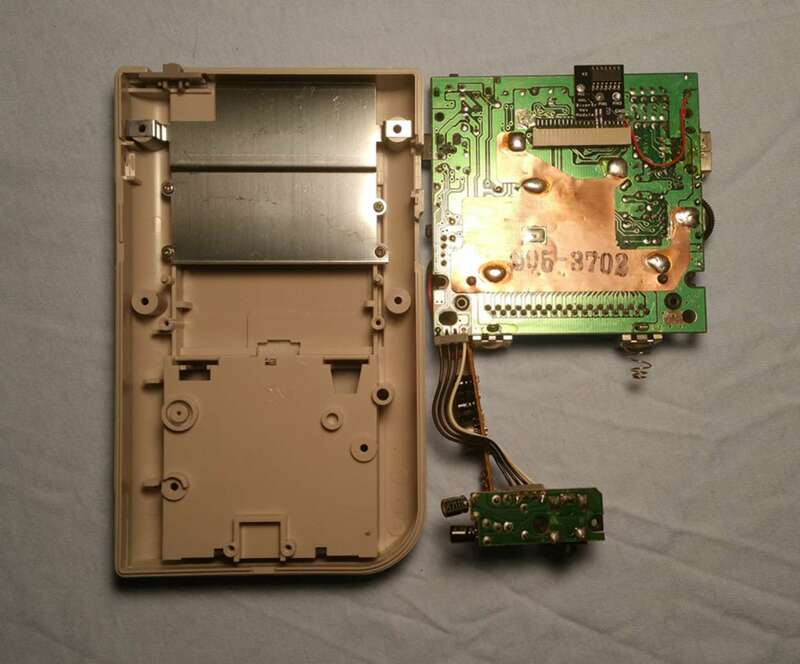 Carefully unplug the ribbon cable to separate each half of the Game Boy. Exercise extreme caution when handling this cable! Be sure not to lose small pieces like the power switch and link port cover. Using a phillips screwdriver, remove and store the screws used to mount each board. Carefully pull the motherboard from its housing. No force should be necessary to remove the shell. The front motherboard has the extra responsibility of housing the buttons. When removing the front shell, these components will likely fall out or stick in place. Examine your replacement shell closely and make sure you have enough screws to proceed. Aftermarket shells often come with a full set of screws. Place each half of the new shell on a gentle surface. Place the back motherboard into the back half of the new shell. The motherboard should fit into the new shell without using force. Put the power switch into place in the upper left corner. The battery contacts may need to be adjusted into place. Place the buttons carefully into the front half of the new shell. Small notches will guide each button into place. Put the appropriate silicone pad between the buttons and motherboard. Carefully fit the speaker into the circular shaped slot. It will also be guided by a small notch. The screen should be aligned with the bezel on the new shell. Using a phillips screwdriver, screw the front and back motherboards into place. It’s easy for components like buttons and silicone pads to shift during this step. If a screw isn’t fitting easily, check to see if the front components are still in place. Line up the halves of the shell carefully. Be mindful of the ribbon cable. If the shell doesn’t fit together easily, double check your work and ensure the motherboards are attached properly and level. Nothing should be forced when putting the motherboards into the new shell. If everything lines up well, it’s time to plug in the ribbon cable. This cable is vital to the Game Boy display. Carefully insert the cable into the slot, trying not to bend any pins and wires. Attach both halves together using an appropriate screwdriver. There will be 6 screws used in this step. Congratulations! 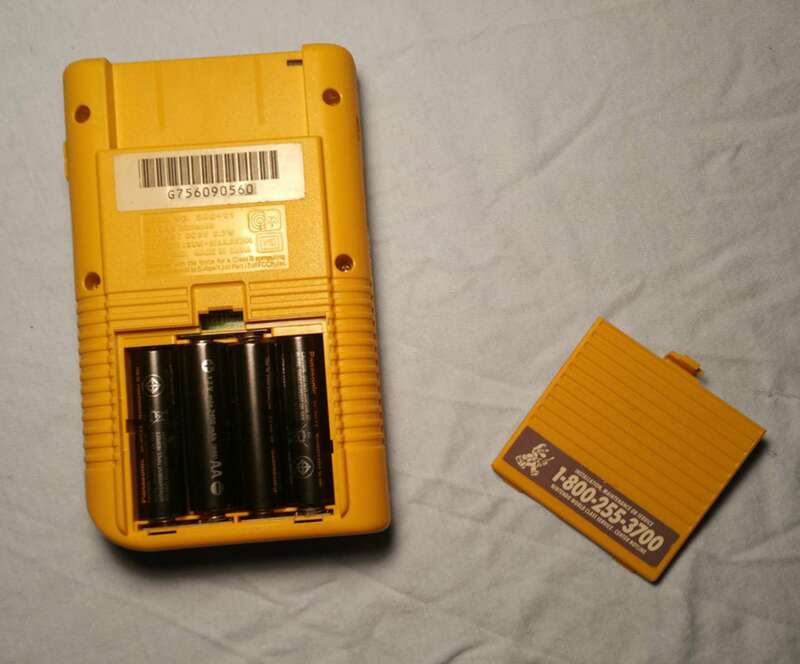 It's time to install a fresh set of AA batteries, snap the battery cover in place, and power it up! If everything went well, you should hear the beautiful sound of startup audio, see dazzling 8-bit graphics, and have working buttons to drive your gaming adventures! 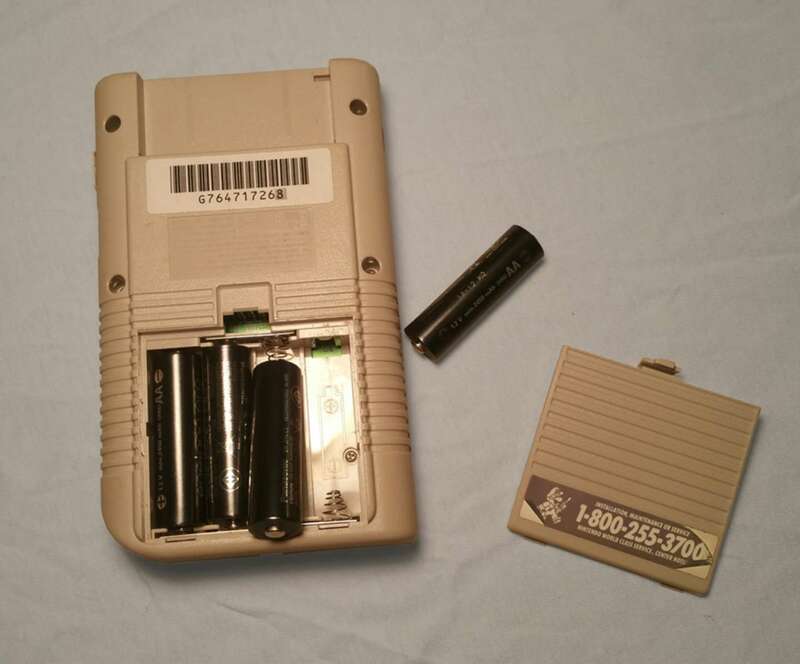 If the Game Boy will not power on, double check the battery installation. If there is no audio, unscrew the outer shell to verify the speaker is undamaged and properly installed. 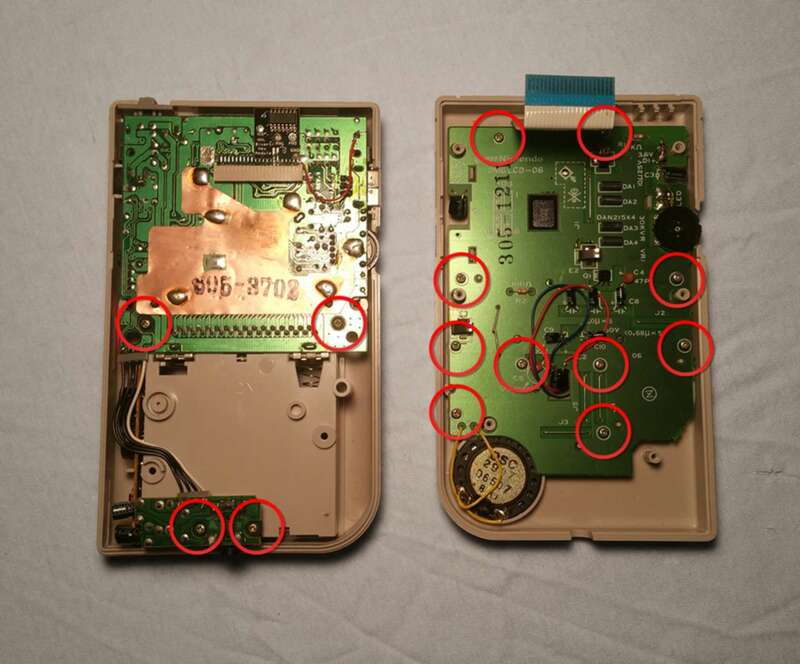 If there is no output from the display, unscrew the outer shell to verify the integrity of the ribbon cable. 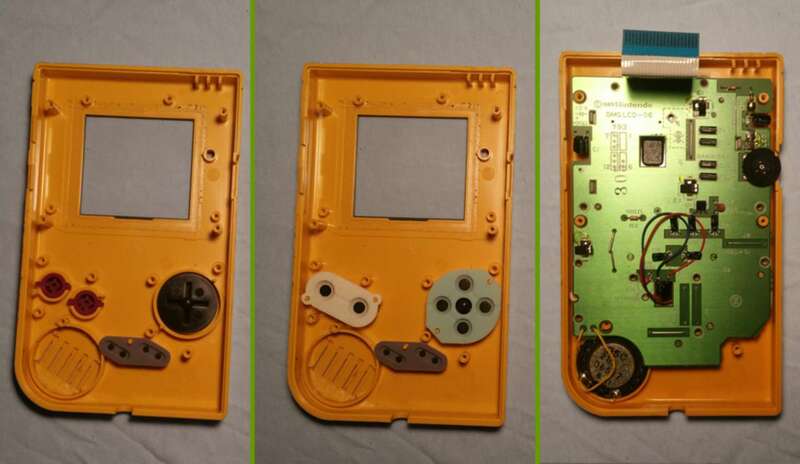 If followed carefully, your Game Boy will now be comfortably housed in its new shell. Thank you Mario, but our Princess is in another castle!